This passage gave me pause for the first time. What would Frodo have told them under the questioning? He clearly did not tell them much of value since Shagrat would (presumably) have told Sauron everything he knew about Frodo before he was (evidently) killed. The information in the possession of the orcs about the "spies" being some kind of strange dwarf-men, which was the closest to accurate information that the Mordor orcs had at their disposal must have come from Shagrat and the Morgul orcs that made it out of the Tower first. We don't have any idea who the Morgul orcs who made it out first were or their status but I don't believe it is safe to assume they would have been present in the interrogation given Shagrat's distrust of Gorbag's "lads". The fact that the orcs did not glean more useful information out of Frodo is rather incredible. Clearly, there is no reason to suppose that Shagrat and Gorbag knew the right questions to ask to really get to the bottom of things and Frodo would certainly not want to volunteer any information in that direction. I didn't dare to move when I was left alone, or one of the guards came. But the questioning did apparently go on for some extended period of time because Frodo describes it as "until I thought I should go mad." I suppose he may have just refused to speak to them at all, and I would think it would take a long time of this before Shagrat and Gorbag grew bored and frustrated. However, the timeline is interesting because Frodo's statement implies that some time passed between the end of his questioning and the beginning of the fight. The two captains did not begin the fight right there in front of Frodo. They did not torture Frodo because of Sauron's orders and Frodo even said that he was not seriously hurt. That might have yielded some useful results...or it might not have. Again, if nothing else Shagrat and Gorbag would not have had the information needed to ask the right questions. I have a hard time imagining that Frodo didn't say anything to them but I also cannot imagine anything he could have said that would not have raised more questions that I don't think Frodo would have been able to satisfactorily explain away to get them to leave him alone. I agree. If the idea of an enemy trying to enter Mordor with the aim of reaching Mt. Doom in order to destroy the One Ring had not occurred to Sauron himself, lowly fighting-orcs couldn't have been any more perceptive regarding Frodo. But that begs the question of what he could have told them to satisfy them. Well, I think it's safe to say the presence of Faramir's band in Ithilien was known to the orcs in the area. Frodo had a staff given him by Faramir, and maybe that would have been observed as being a product of Gondor. The orcs might have begun with the assumption that Frodo was indeed just a forsaken spy sent by the hated men of Minas Tirith. Also, judging from the conversation of Shagrat and Gorbag as overheard by Sam, the orcs were considering that Frodo was the lesser of two spies in the area, the one still loose maybe being an elf-warrior. That being the case, Frodo himself would probably have been the main focus of the orcs' worries. Maybe they had other things to attend to in the meantime? Such as itemising his possessions- which Shagrat had orders to do: "Prisoner is to be stripped. Full description of every article, garment, weapon, letter ring or trinket is to be sent to Lugbúrz at once, and to Lugbúrz only." But it's also possible they left him alone deliberately, to let his imagination do the work. After all poor Frodo didn't know they weren't allowed to torture him. I can see that happening, or something close. Maybe a pair of brutes sitting in his room and promising him all sorts of things to come, only throwing in an occasional question. To them it was more play, but Frodo could have taken it as questioning. As far as what Frodo told them - it certainly wasn't much, going by what we have from the Mouth of Sauron. And if Pippin's fiasco with the Palantir can be used to judge all hobbits, he would have probably given as little as possible, some one-word answers or nods or something. What makes me wonder, though, is that the Mouth of Sauron never mentioned the second spy. The orcs knew of Sam's presence, and the question "did you come alone" does not seem very much out of repertoire. With even the shred of this knowledge, the Mouth could have bluffed and told them the other spy was also captured or killed. Is it all thanks to the orcs forgetting everything in the fight and then covering up their misses by failing to report the high suspicion of the second, more powerful spy? Is orc delinquency the only reason the whole plot failed through - Sam was not searched for properly and the Mouth inadvertently gave the spokespeople an indication that not all might be lost yet? Would individuals like Shagrat and Gorbag have even been aware of the Ring? That is true. He may have been told stories about lovely Lugburz and what to expect...at least they said that is what they would do. Frodo may have been surprised that they did not physically harm him. He was naked, lying as if in a swoon on a heap of filthy rags: his arm was flung up, shielding his head, and across his side there ran an ugly whip-weal. `Frodo! Mr. Frodo, my dear!’ cried Sam, tears almost blinding him. `It’s Sam, I’ve come!’ He half lifted his master and hugged him to his breast. Frodo opened his eyes. Frodo was still suffering from the effects of Shelob's poison when he was 'questioned' (whatever form that took). He was delirious - look at the nightmarish description of the Orcs, with his focus on 'their claws and eyes'. He was still not entirely connected with reality when Sam showed up - 'There was an orc with a whip, and then it turns into Sam'. Not 'and then Sam rescued me', but 'it turned into Sam'. He was also filled with Orc-draught, which could have interacted in any number of ways with spider-venom. What does happen if you mix a powerful sedative with a powerful stimulant, both of them steeped in the Shadow? I'm gonna go out on a limb and say 'nothing good'. And finally, he was (once he realised what was happening) in the depths of absolute despair - so far as he knew, the Orcs had the Ring. Look at that description of his failure; it has the lyrical construction of utter misery. So: delusional, drugged both up and down, and sunk into despair. He thinks the Orcs know exactly what's going on - their gloating over capturing him reads, to Frodo, as gloating over reclaiming the Ring. Their questions, then - who are you? Why are you here? Is there anyone else with you? - must feel like purest mockery. They can't be expecting him to answer (Frodo thinks), because they already know everything that matters. And finally, he was (once he realised what was happening) in the depths of absolute despair - so far as he knew, the Orcs had the Ring. That is a good point and points up a flaw in my original thinking. I overlooked Frodo's belief that the orcs had taken the Ring, which would mean that he would no longer have had a mission to try to protect. Perhaps Frodo struck the orcs as so delusional and strange that there was little to learn from him and that is why they eventually left him alone. Fortunately for the good guys, there was only one survivor of the mutual slaughter at Cirith Ungol- Shagrat, who took the confiscated items to Barad-dur and was promptly executed for his trouble (this last in an unpublished MS.) It is entirely possible, even likely, that Sauron took his tale of a "great Elf warrior" as a lame excuse for what was plainly Orcs being Orcs (as the Nazgul probably would already have told him), a fiasco for which the commanding officer would be held accountable, in the usual Evil Overlord manner of enforcing discipline. It is entirely possible, even likely, that Sauron took his tale of a "great Elf warrior" as a lame excuse for what was plainly Orcs being Orcs (as the Nazgul probably would already have told him), a fiasco for which the commanding officer would be held accountable, in the usual Evil Overlord manner of enforcing discipline. I don't know that is entirely the case. Shagrat did provide some evidence of Frodo's and Sam's presence. Just in a very garbled state and paired with a grade A military debacle. I'd say Gandalf deduced that last from that fact that he (the Mouth) was attempting to bargain at all. If Sauron had had the Ring at that point, he'd have won. It's like Werewolf. Once the pack has winning numbers, it's time to stop bluffing and start gloating, no? ~Brought to you by the Foundation for Gratuitous Werewolf Comparisons. I'm leaning towards Shagrat keeping mum about the whole thing about the Elf warrior in a "not my fault, I don't know anything, it was all Gorbag" kind of way. Well also it's that you thought it was end-game but then you realized the wolves neglected to make a kill last Night and you have an extra person and therefore another game phase. ‘Silence!’ said Gandalf sternly, thrusting him back; but the Messenger laughed aloud. When the Mouth brings out the 'tokens', he is showing the Company things owned both by Frodo and Sam. So far as they know, this means that both hobbits have been captured, and the Ring reclaimed. The Mouth, then, is here to gloat, nothing more. But then (appropriately enough) he opens his mouth, and reveals what he doesn't know - 'but to send them as spies into Mordor is beyond even your accustomed folly', he says, instantly telling Gandalf that he doesn't know about the Ring. But he's still saying 'spies', plural, and here Gandalf (who still has no reason to doubt that both Frodo and Sam are prisoners) is simply lucky: he doesn't say anything to confirm that plural. Then the Mouth puts his foot in it: he stops using vague plurals, and speaks of a single spy. Possibly the plural was a deliberate ploy (to try and tease out any information the Company might have about the inconsistency in Shagrat's story), possible just sloppy languages; whichever way it goes, instantly, Gandalf knows that only one hobbit was captured. He can't be sure which (the sword says Sam, the cloak says nothing, the vest says Frodo), but he can be confident that there is still a good chance that a Ringbearer is free in Mordor. He doesn't let it slip - telling the Mouth that would be the height of folly! - but it informs his actions thereafter. In effect, Gandalf has been brought to the exact same knowledge the reader has at this point. As an aside: it's a real pity that no adaptation of the books will ever be able to capture the suspense of this chapter. A first time reader has no idea what's happening in Mordor. They know only that Sam is alone in Mordor, Frodo a captive - and now the Mouth says he's going to be tortured! And then the battle, and it's clear that the West is losing, that everything is going to fall... and away we cut to Book 6, and the eucatastrophe comes. I'm also really surprised, looking at the chapter list, at how short the journey in Mordor is. It's only three chapters! The stuff the movies packed into the 'Endings' is twice as long as Frodo and Sam's journey from Shelob to Mount Doom! Eesh, it doesn't feel that way in the book, does it? Would it have been possible for Shagrat to have kept anything back from Sauron at that juncture? "That comes from Higher Up. First they say it's a great Elf in bright armour, then it's a sort of small dwarf-man, then it must be a pack of rebel Uruk-hai; or maybe it's all the lot together." And I believe Shagrat is the only possible source for that information (such as it was). Sounds like he might have changed his story several times, actually. Anyway, I don't think the Mouth's failure to mention the presence of a second "spy" is, by itself, what tipped Gandalf off- he doesn't openly show scepticism until somewhat later, and then it pertains to the Mouth's "haggling". I'd say it's more that there's an accumulation of "tells" that make it clear that the Ring hasn't been recovered and that, in fact, he has no idea what the "spy's" real mission was (cf. my points and Huinesoron's). Shagrat brings the Mithril Coat and other spoils to Barad-dûr, but is slain by Sauron. If he was killed by Sauron, it seems likely to me that he was also questioned by him. Grishnákh mentioned a "Questioner" (with a capital Q) to Merry and Pippin, although who that was is obviously unclear. Personally I imagine that Shragrat was probably quite open with Sauron, perhaps thinking that he was going to make himself look good. If he was loyal/obedient/stupid enough to deliver Frodo's equipment (and therefore evidence of his own incompetence) to his superiors at Barad-dûr, I might be willing to imagine that he was also honest and thorough in his report. Last edited by Zigûr; 12-06-2017 at 07:18 AM. "Ar!" said the tracker. "They’ve lost their heads, that’s what it is. And some of the bosses are going to lose their skins too, I guess, if what I hear is true: Tower raided and all, and hundreds of your lads done in, and prisoner got away..."
So the message goes out to scour the Black Land for a tall elf, but Shagrat doesn't get long to bask in the glory. At this point, if he's not already being questioned by Sauron, he gets taken directly to the Lord of the Black Land. I imagine Sauron would operate something like the Romans treated slaves - when an orc tells you something that might be important, torture and interrogate him to check whether it's true. After all, what's one orc less? And Shagrat's story does change. It emerges that while his mention of an elven sword holds up, the warrior in question was actually 'another one of the little rats' - a halfling, a sort of small dwarf-man. Fine (thinks Sauron), I know Saruman had and lost one of those, I know Gandalf keeps sending them out on all sorts of stupid errands, I know in fact that one was used to sneak into Erebor and scout for the attack on Smaug... clearly this is another sneaky trick like that. And he sends out the word that they need to watch for Hobbits. At this point, Sauron has already had his showdown with Aragorn via palantir. He's already lost a battle of wills. He's rattled. In fact, he's thrown his entire army at Minas Tirith and failed to take it. He's certain that Aragorn has the Ring - hence why 'Shire! Baggins!' doesn't even occur to him as a reason for Frodo's presence - and he thinks that Frodo and Sam are scouts for the invasion. Except... that doesn't explain why the Captain of the Tower is here in person, and wounded to boot. Has the invasion already started? Send for Shagrat again! So now, instead of the prisoner, Shagrat is being interrogated about the fall of the Tower. And yes, he has to admit it fell - but his explanation is garbled (because, y'know, he's been tortured). Sauron manages to gather that it wasn't the Hobbits who killed everyone, or an army from the West - but orcs, claiming to be from Minas Morgul. It's a perfectly logical story which happens to be wrong in every particular. But it feeds into and off Sauron's prejudices, specifically the belief that no-one would ever give up any source of power. Aragorn must have the Ring, because why would he surrender it? He must have sought alliance with Saruman, because Saruman is strong (and his Voice is persuasive enough to sway anyone). To Sauron's Eye, Aragorn+Saruman is the enemy now, and hobbits + orcs are the invaders. So out goes the third message: The Enemy Is Us. Look out for rebel Uruk-hai in Mordor. Keep a special eye out for deserters, who might be defecting. And bring everyone up to Udûn - the Nazgul are watching the Tower now, he'll know if there's an invasion from that side. And since Shagrat is now useless - he lost his command, he's been in contact with rebel troops, and he's only got a few fingers left besides - Sauron might as well kill him off. I don't think there's textual evidence for the 'Sauron believes Saruman has turned' theory, but I do think it all hangs together. So now, naturally, it's going to get ripped to shreds. It's an interesting theory of an Uruk-hai sabotage, Huinesoron - except in your version Sauron finds out there were TWO hobbits involved. If that was the case, the Mouth would have been talking in plural. What's another bluff in that speech? Hmm, that's an excellent point. So I guess we have to assume that the 'elf warrior' story was disregarded completely by the Powers That Be - first in favour of 'Frodo escaped by himself' ('there was no elf warrior... just the short one...'), and then 'an orcish rebellion helped him get away'. Because you're right - I don't think the Mouth can have known there were two Hobbits, otherwise specifically saying one would have been as good as saying 'your plan has not yet failed'. Whatever the details, I kind of appreciate the fact that Frodo's success wasn't just a run of blind luck, but the result of Sauron being repeatedly fed both deliberate and accidental misinformation. From the moment Pippin looked into the Palantir, Sauron seems to have had everything 100% backwards - and that led directly to his downfall. A good post from Huinesoron. Here are a few things I've observed. I suppose it would depend on whether Shagrat followed Gorbag's advice or ignored it. If he ignored it and sent a preliminary report to Barad-dûr, that might explain the conflicting information the scouts had later. I feel like there was a point where we saw a Nazgul leave the Tower, but I think that was probably to do with Isengard instead? On the early morning of the 6th of March a Ringwraith flew to Isengard in response to Pippin looking into the Orthanc-stone; another one had already gone on the night of the 5th to investigate why Saruman was being tardy with his reports. At this time Frodo and Sam were still at the Morannon. By the time Frodo was captured on the 13th, I think Sauron would have definitely known that Saruman had been defeated and the power of Isengard overthrown. "Out of the black sky there came dropping like a bolt a winged shape, rending the clouds with a ghastly shriek." I think this place is being watched. I can't explain it, but well: it feels to me as if one of those foul flying Riders was about, up in the blackness where he can't be seen. This suggests to me that a Wraith was sent to Cirith Ungol deliberately in response to something prior to Shagrat's arrival at Barad-dûr, which happened on the 16th according to the unpublished time scheme. 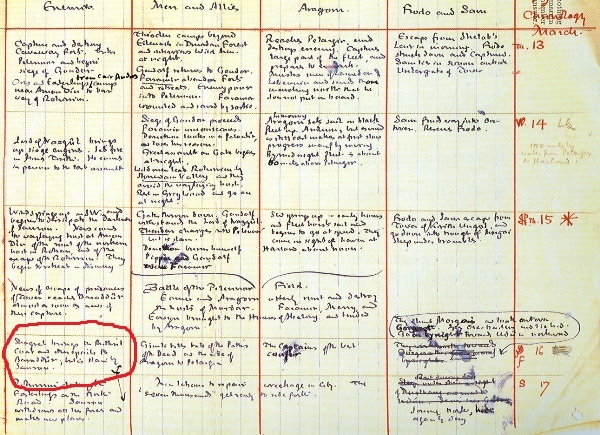 In fact, the time scheme points out (as far as I can interpret Professor Tolkien's handwriting) that on the 15th "News of escape of prisoners of Tower reaches Baraddûr (sic) almost as soon as news of their capture." 4. I'm unsure of this part, but then possibly news of the capture reaches Barad-dûr. A Nazgûl flies to Cirith Ungol but arrives to find the guards dead and the prisoner gone. 5. Shagrat arrives at Barad-dûr, is interrogated and executed. Perhaps I've gotten the wrong end of the stick somewhere, but it seems to me that information came to the Dark Tower before Shagrat's own arrival. In any event, this is all very interesting, isn't it? I always find piecing the timeline together satisfying. EDIT: It also occurs to me that even if Shagrat did not send an initial report, word may have come to the Dark Tower anyway; Shagrat didn't trust either Gorbag's company or his own. The Nazgûl at Cirith Ungol may have been watching in response to the Silent Watchers at Minas Morgul, I suppose. There's a lot to consider. Last edited by Zigûr; 12-07-2017 at 10:46 AM. There is a flaw with this, however, in that Shagrat actually fought Sam (however briefly) so he knew and could have potentially reported that there was more than one enemy in Cirith Ungol. He might have had the same problem as Snaga in understanding that Sam was a hobbit but he could have been in no doubt that Sam was an enemy. Of course, it is likely that the orcs were not familiar with hobbits and wouldn't be able to classify them as such and Sauron figured it out from the descriptions. I think the point is more that Shagrat would not have the strength of will or greatness of soul required to defy Sauron in any way in Sauron's direct presence. I believe abject submissiveness and groveling is what we need to picture, a pathetic and desperate need to try and please. I don't think Sauron killed Shagrat out of callous disregard for Shagrat's life. He executed Shagrat for his catastrophic failures of command in allowing a strategic border garrison to be destroyed due to a internecine squabble. For that kind of fault Shagrat would have been executed by practically every military in history. What sort of means might Shagrat have had to send such a message so quickly? In fact, this opens up a potentially wider topic on communication, but focusing on the topic at hand; Minas Morgul clearly had some kind of hotline straight to Barad-dur. It is possible that some kind of Ósanwe continually connected Sauron to the Ringwraiths, although they are spoken of as communicating through mundane means as well. Another likely possibility is Sauron made use of a kind of fell-beast express for transmitting messages. However, we hear nothing about any kind of facilities for such existing at Cirith Ungol and clearly Sauron was not in direct telepathic communication with his orcish minions. Were the Watchers, perhaps, in some way hooked into a wider "security net" for Mordor where Sauron would be aware if one of the Watchers in the realm was uneasy? I would imagine that the first message ("prisoner captured at Cirith Ungol"), if it existed, was sent the conventional way, on foot. If it was sent on the 13th it might arrive on the 15th, as I believe Shagrat left on the 14th and arrived on the 16th. Then I imagine that the second piece of news ("prisoner escaped") was not sent by Shagrat at all, but communicated quickly by the means you've discussed (which I also discuss a bit more below). Unlike a message sent on foot, there's time for all of that news-sending to happen on the 15th if it was done by air (or some supernatural means). Then the third piece of news is delivered by Shagrat on the 16th. Another likely possibility is Sauron made use of a kind of fell-beast express for transmitting messages. Yes, these were the two possibilities which occurred to me; one possibility is that the hypothetical news sent by foot arrived on the 15th, a Ringwraith investigated and discovered what had happened since, hastily flew back to the Dark Tower with news, and then returned to Cirith Ungol to take command. All this could conceivably have happened before Shagrat reached Barad-dûr. The other I considered is that the alarms of the Watchers revealed that something had gone wrong. That or, as you say, some kind of telepathic link between Sauron and the Nazgûl, although I'm not sure how much evidence there is for that (and I suspect that there may be evidence to the contrary, as you've also indicated). Last edited by Zigûr; 12-07-2017 at 08:53 PM. I think you and G55 are looking at this through the lens of your own knowledge. Though the Mouth does mention the possibility that Frodo's "errand was one that you did not wish to fail", that's only in passing. I see no hint that he had any idea it was of *crucial* importance. It's Frodo *himself* whom he seems to think is the real prize. In other words, in his ignorance he chooses *the wrong thing* to bluff over. You may have a point about this. If he believes the hobbits (however many of them there are!) are there as spies, well, so what? The Nazgul are aware now, so there's no chance of them getting back out the way they came - and anyway, Aragorn's army is there. What can a spy or two in the heart of Mordor do to prevent their immanent destruction? Well... quite a lot, as it turned out. Late in the day (I think? Sam says he thinks Frodo's been captive for a day or so, and they escape on the night of the 14th/15th), Frodo is taken captive. Shagrat had orders to send a message as soon as the prisoner's belongings had been checked; assuming he did so, it probably left that evening or the next morning. Message 1 - prisoner taken, list of belongings. Checking the timeline, it takes Frodo and Sam about four days to cover the distance; I would guess an orc could manage it in three, or two at a push. Fighting breaks out in the Tower over Frodo's belongings. Given Gorbag's comments earlier - 'If there's any game, me and my lads must be in it.' - and Shagrat's comments about him, it seems likely he's the one who started it. Late in the day (or rather the night), Sam breaks past the Watchers, setting off the alarm in the Tower. This may telepathically inform Sauron and/or the Nazgûl - the latter would explain something a bit later. Message 2 - security breach. Message 2 is received immediately. Sauron knows something is going on (but not what). Sam battles his way through the Tower and finds Frodo. Shagrat flees the Tower and heads to Lugbúrz, carrying Frodo's belongings with him. Message 3 - fighting in the Tower, Frodo's belongings, Sam's appearance. Frodo and Sam leave the Tower, shattering the Watchers and potentially alerting Sauron or Morgul. Message 4 - catastrophic security breack. A moment later, a Winged Messenger comes screeching down out of the sky. What was it doing there? How about responding to the break-in alarm the previous night? It could have been circling overhead, waiting to see what would happen. This would partially confirm Message 2 as happening, which would confirm Message 4. Message 4 is received immediately. Sauron knows the Tower has been fully breached, and may know that Elvish art was involved (depending on the detail levels). Whatever the case, the Nazgûl would certainly inform Sauron as soon as possible, which means very soon (one way or another). Message 5 - fall of the Tower, guard almost entirely dead. Message 5 is received that morning. Sauron knows the Tower has fallen, but he still doesn't know why! Message 5 is probably received early on this day. What does Shagrat say, as he runs breathless into the Dark Tower? If Message 1 never happened (it's possible Gorbag killed the messenger - we know from Snaga that Gorbag’s swine got to the gate first, and none of ours got out), then he probably leads with 'we caught a prisoner', but he's not going to be able to hide the fact that the Tower has fallen. If he even tries - so much the worse for him. Sauron already has at least one message about the fall, and up to three. So what did Sauron find out from him? We know that the first story Shagrat gave was 'shining elf-warrior', and that this was believed long enough to be passed on to the police (as it were). Could this have been the point where Sauron summoned him directly? If Sauron spoke to him first, then we have to assume he lied to the Dark Lord, which (as Kuruharan says) seems a little far-fetched. ... and then Sauron has about eight days to stew before Aragorn, the presumed Ringbearer, shows up at his gate. This is where the 'rebel Uruk-hai' story comes in, and it actually comes pretty quick: it looks like Frodo and Sam overheard the Soldier and Tracker discussing it on the 18th. Whether it sprang from my Saruman theory (which doesn't depend on inaccurate reporting), or from generalised concerns about rebellion at Minas Morgul (whence Gorbag), it clearly came to Sauron's mind very quickly. News of escape of prisoners of Tower reaches Barad-dûr almost as soon as news of their capture. So there were three separate messages: one announcing the capture, a second announcing the escape, and the third being Shagrat. Note that March 15 is the day of the escape, and two days before Shagrat's arrival with the mithril-coat etc. I think therefore we can assume 2 days' journey (as the Orc runs) between Cirith Ungol and Barad-dur; this is consonant with the news of the capture (on March 13th) arriving on the 15th. Whereas the news of the escape was brought by some mode much, much faster, almost certainly a Nazgul. I don't think it much of a stretch that the Nazgul that arrived just as F&S were escaping had been dispatched expressly because of the news that a "spy" had been captured, and its (original) assignment was to return the prisoner for interrogation; and that instead it returned to Lugburz to report on the clusterfark it found. (I think we can disregard Tolkien's use of a plural here as a slip, in a note jotted in haste. No version of the story ever had Sam taken prisoner). Why did Sauron take no more decisive action when the first message arrived? Because he had other things on his mind-- like his main army assaulting the principal stronghold of his enemies, and unexpectedly being annihilated. That pretty much had the Eye's undivided attention on March 15. Last edited by William Cloud Hicklin; 12-10-2017 at 11:09 AM. Another thought, on the parley at the Black Gate: If Sauron had recovered the Ring, Gandalf as Narya's keeper almost certainly would have been aware of it, just as Celebrimbor et al had been when it was first forged. I wonder why Gandalf is so worried about the 'darkness' that has spread from Mordor, if Narya would 'tell' him Sauron did not have the Ring, when Faramir tells them he has met Frodo and Sam (and Gollum). I know Gandalf fears Gollum's treachery, but Pippin realises with a thrill of fear that Gandalf himself is troubled, even afraid. Faramir knows about the Ring, and connects Gandalf's immediate fear with the darkness that has begun. Faramir does not know about Narya, of course. And it is he who verbally connects the darkness with the supposed recovery of the Ring ... but I still had the impression that Gandalf was thinking of it, too. Is Gandalf actually wearing Narya at this point? (Same question for Galadriel and Elrond.) It seems like, if you'd just sent the One into Mordor, and knew that Sauron could access all your thoughts in an instant with it if he captured it, taking your own Ring off would be the logical first step. Doing a quick trawl for ' ring ' in RotK, there are only six mentions of the word in such a context prior to Book Six, and all are talking about the One. Nothing to prove Gandalf is still wearing Narya. It says a lot about Gandalf's intelligence that he immediately 'solved the case' like this. But what it also says is that he doesn't know the status of the Ring for certain. -That Gandalf is not wearing Narya, which I think would have to be for safety reasons. -That he thinks Sauron might refrain from putting the Ring on until the crucial moment. As he turned and came towards them Frodo saw that Gandalf now wore openly upon his hand the Third Ring, Narya the Great, and the stone upon it was red as fire. I've always placed the emphasis here on 'openly'... but is it possible that 'wore' is just as significant? I appreciate the confirmation of the timeline around the Tower; so the message about the prisoner arrived first? But it arrived by the 15th, which... let me check the map. Okay, so it's about 60-70 miles from the Tower to Lugbúrz in a straight line. Assuming 36 hours as a timeframe, you could cover that in a continuous amble; a running messenger could do it and even take breaks. Assuming a Winged Messenger could make the return trip in an hour or so... yes, this is a consistent timeline. I don't know about the idea that the Messenger just happened to be on final approach to the Tower when Frodo and Sam broke the Watchers and brought it down in a hurry. That sounds a bit too convenient. Perhaps he* was instead passing over on return to Minas Morgul, and broke his journey to investigate the happenings at the Tower he was bearing word about? That's a little less... neat. *Do we actually know that the Nazgûl are all male? I know they're Men, but... y'know what, there's probably a thread about that around here somewhere. I'll take a look. Maybe he wasn't sure what Sauron putting on the Ring would feel like. This could be explained that unlike Celebrimbor Gandalf was never in any doubt about Sauron's intentions. Part of what was so shocking was that the elves had been deceived about Sauron's intentions and his putting on the Ring took the mask off that. If Gandalf was always in some level of spiritual contention with Sauron, similar to Galadriel, perhaps he might be unsure what to expect. It does seem a little convenient, I will admit, but given a plausible overall scenario, which I think is laid out here, a little moment of dramatic coincidence could be forgiven. However, I always had the idea that the Nazgul was only watching the Tower until the Watchers went off again. Let me just start by saying that this tread has been an absolute joy to read through! Message 1 probably arrives at Lugbúrz on this day (if it was ever sent); Sauron probably kills the messenger, because who wants to hear 'we've caught a prisoner' after already knowing that everyone's dead? Why would he kill a messenger for bringing outdated news? That seem like an over the top hollywood bad guy move. Sauron is clearly not bothered about loosing a few orcs if it serves a tactical or strategic purpose (keeping Shelob fed being the best example), but there is little to indicate that he kills randomly due emotional instability. I see no reason to believe that the three was not in use. The rings give power according to the stature of the wearer, and we have no way of knowing the exact nature of this power.When Celebrimbor perceives Sauron, there is an important element of treachery, I cannot help but to think that this is key in Celebrimbor perceiving Sauron (this is not backed by any written sources). My point is that I don't believe that just because you wear one of the elven rings, you will automatically be aware if Sauron comes in possesion of the one ring. Tolkien's magic tends not resemble the laws of physics and be somewhat erratic. Most importantly: Samwise does not see Galadriel's ring, yet she is clearly wearing it and weidling its power. It also seems like it would be prudent to use the power of Nenya in the effort to protect Lothlorien from Sauron's forces.